If you need a cheap, quick lightning arrestor for your antenna or just about any type of wired system, this idea from Mr. Burgess Brownson looks like a good idea. He used an automotive spare plug. 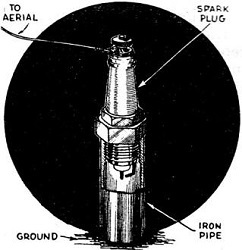 Voltage breakover points can be set by varying the spark gap distance. The old vacuum tube transmitters and receivers had a better of chance of surviving a lightning strike because the components were able to handle much more of a shock than our modern semiconductor sets with miniature, closely spaced components. Still, the spark plug setup is better than nothing, if for no other reason than to protect the shelter. it should suffice. 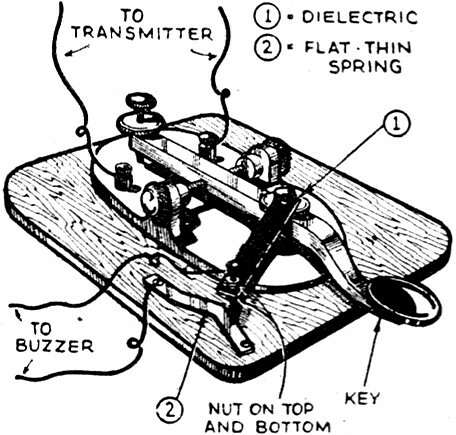 This and many more 'kinks' are offered in this 1935 Short Wave Craft. 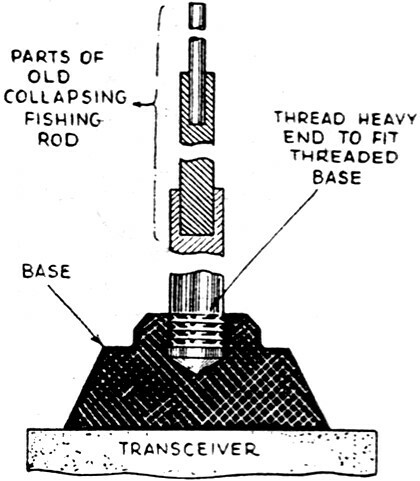 Here is a description of the broadcast adapter which will permit the reception of stations operating on the regular broadcast band using a short-wave receiver. To operate this instrument, remove the plug-in coil and connect the new long wave tuner. This can be done either with a 4-gang switch or the leads from the tuner can be connected to a tube base which will plug into the plug socket. - Alfred Koczan. During a repair job I needed something to rest my hot iron on and hit upon the idea depicted above. 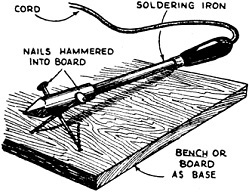 It consists merely of two large nails driven in a board as shown in the drawing. - Edward Brown. Here is just one more use for discarded spark plugs. 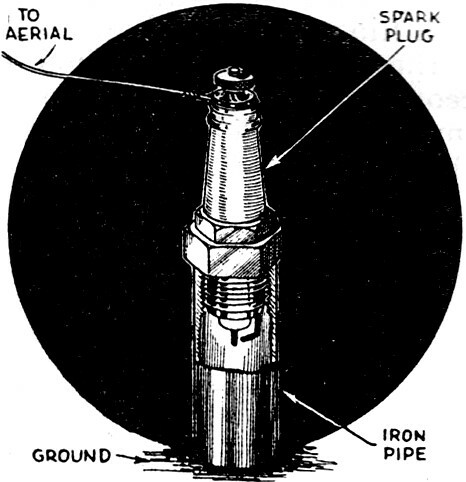 Procure an old spark plug, one whose insulation is not damaged, and clean it thoroughly by removing all carbon. Then obtain a length of iron pipe which can be either threaded or which has an inside diameter large enough to permit the insertion or a plug with sufficient tension to hold it firmly. The entire instrument should be driven into the ground as far as possible. - Burgess Brownson. 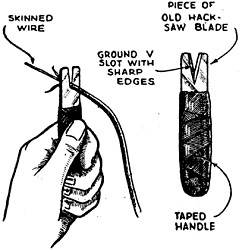 Here is a. simple kink which can be made from an old hacksaw blade or a steel knife. 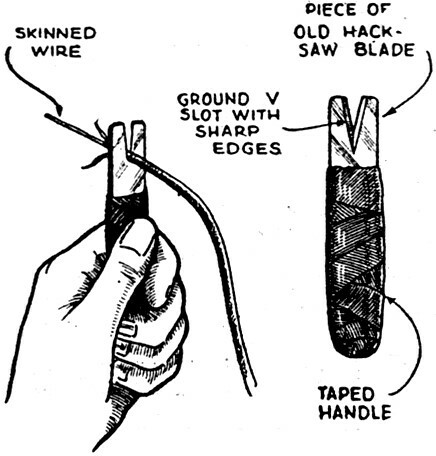 File a V-slot in one end with a three-cornered file, and tape the entire instrument all but the cutting end. - Chas. Wilde. During the course of experimenting I made a simple fastener which can be used to hold a line-cord securely and eliminate the danger of pulling it loose from its connections to the transformer. 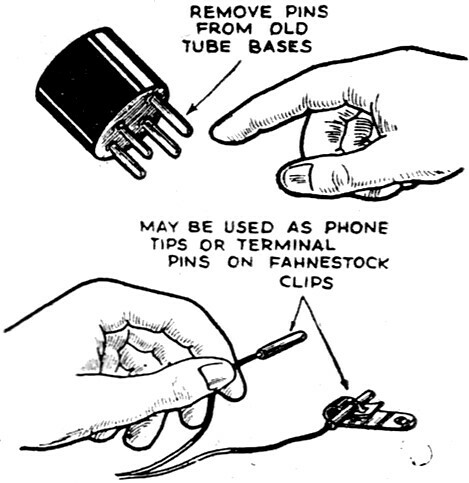 The drawing clearly shows how a Fahnestock clip can be used for this purpose. Screw down in the ordinary manner and use a small length of heavy wire or bus bar to prevent it from opening. - Henry Shry. Many short-wave fans w-ho are experiencing trouble due to interference caused by local broadcast stations can use this simple method to overcome the difficulty. This wave trap can be made from parts which usually can be found in the junk box. The coil consists or 72 turns of No. 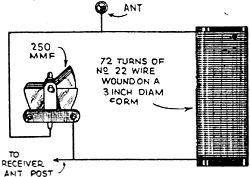 22 insulated wire wound on a coil from 2 to 3 inches in diameter. The condenser should have a capacity of 0.00025 mf. 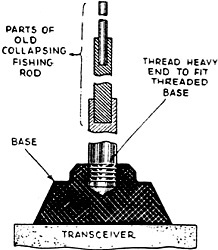 The wave-trap should be connected in series with the aerial as shown in the diagram; then procede to adjust the tuning condenser until the interference from the local station disappears. - George Forest. When building a short-wave adapter I was in need of an "adapter plug" and quickly constructed one from parts found around the "shack." 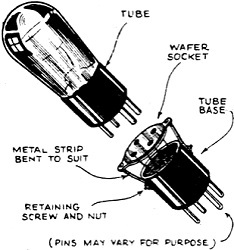 The drawing clearly shows that a wafer socket is fastened to an old tube base and the necessary connections made between the terminals of the two units. Small metal brackets are used to hold the wafer firmly in place. Try this kink when you are in need of an adapter. - J. H. Aceredo. This is my idea of a cheap, still effective transposition block. 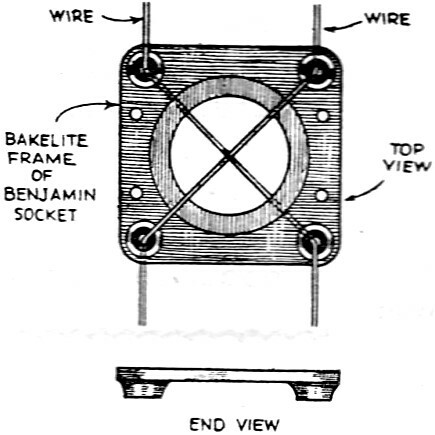 Many experimenters have a great assortment of old bakelite sockets and by removing the shell from the base a very effective transposition block can be made. Many of the older type sockets can be used in this manner and we should hare no difficulty in finding them in the nearest junk box. - Frank Tapper. When in need of a loudspeaker code practice audio oscillator, I hit upon the following idea. 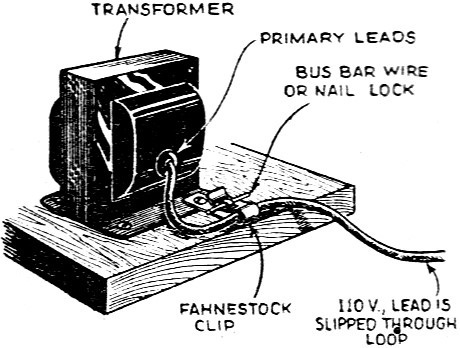 The input transformer to the speaker being center-tapped provided the necessary center-tapped for the Hartley circuit. The 0.01 mf. 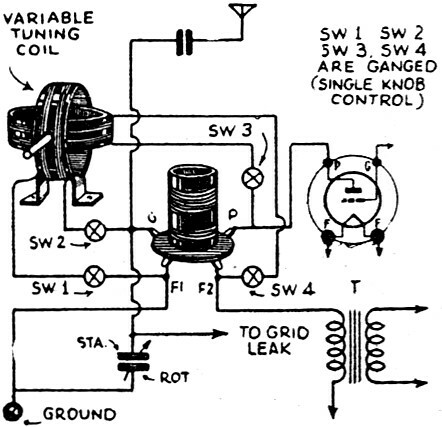 tubular condenser was found to be the most effective and gave the most pleasing tones. 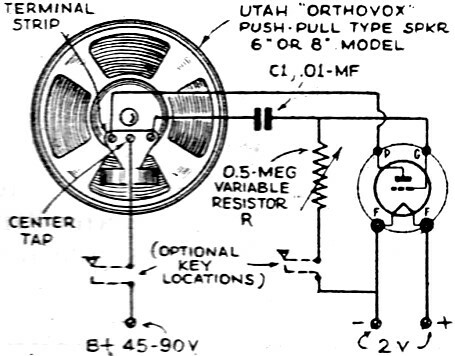 Various pitches can be obtained by varying the resistor. - R. 'V. Bullers. 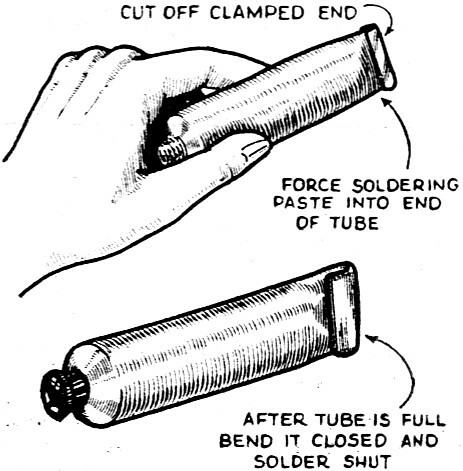 In answer to your call for kinks I am sending you the following: A few years ago I hit upon the idea of using an old toothpaste tube as a soldering flux container. Cut the hard rim off the bottom as shown in the drawing and clean the container thoroughly. Open it and fill with soldering flux. After it has been filled, solder the bottom together again and the job is finished.·-Francis Kemec. 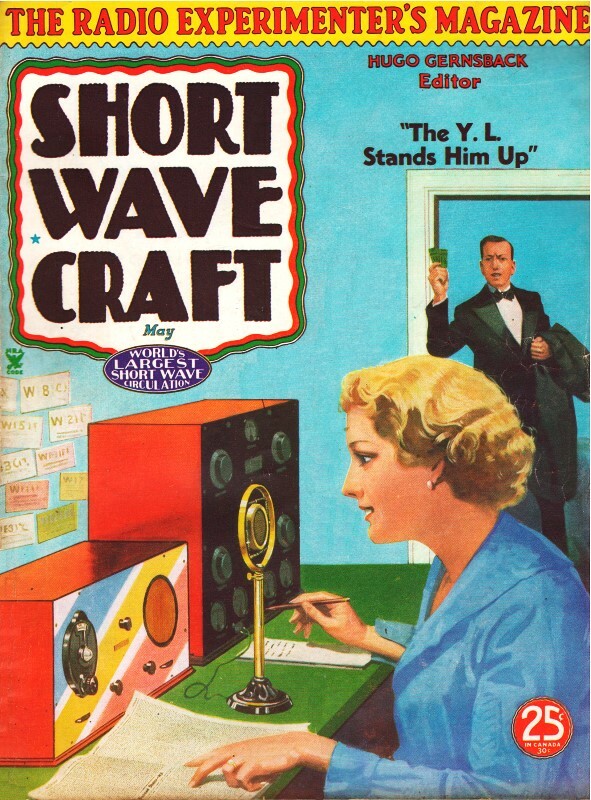 I have been reading your "Kinks" in Short Wave Craft for some time, and think them very useful. So I thought that I would send one of my own in to you. I have been using this kink for some time and it has proved very useful. 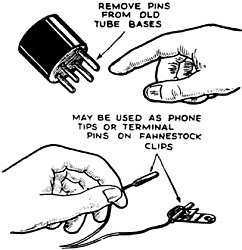 The prongs on old discarded tubes can be used when soldered to antenna, ground, and battery leads, to make a very handy and efficient mean of connecting to Fahnestock clips. They can easily be removed by breaking the entire tube base. Once you get the knack of it, it will prove very successful in making a low resistance connection. - Louis Hartman. 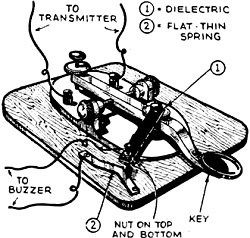 If one desires to hear his own keying other than through monitor, while transmitting, the sketch illustrates how it may be done without any cost providing one has a buzzer and a couple of' standard dry cells. No. 1 is a small piece of any good dielectric about 2 inches long, 3/8 inch wide and 1/8 inch thick, drilled at both ends with holes of suitable size, to fit the screw on the key lever which adjusts the spring tension, and the screw one happens to have, for making contact to the spring. No. 2 a small strip of spring steel bent as shown and fastened down at both ends. 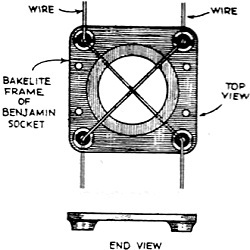 The bend permits of fine adjustment as the contact screw by swinging the dielectric strip backward or forward. Nuts should be placed above and below the dielectric strip on the contact bolt to hold it firmly in place. When the contact bolt or screw has been adjusted and the nuts tightened any further adjustment required may be made by simply moving the strip backward or forward. This extremely simple kink works perfectly. - Harry Porter. Being in need of a collapsible and compact aerial for my portable set, I obtained an old fishing rod, one of those very small collapsing kind. Then I removed the paint, the ferrules, and the handle; then I had the large end threaded to fit a base which I mounted on my set. This made a very good aerial far my small "transceiver." The diagram will explain more fully. ­ R. Tweedie.